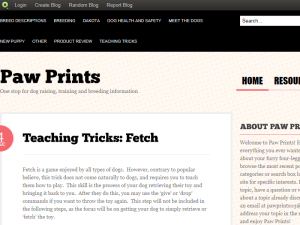 Blog Discription: Paw Prints is a one-stop shop for all information dog related. Our main areas of focus are raising, training and breeding dogs. To help you raise your puppy Paw Prints provides all the information you need to care for your dogs daily, health and happiness needs. Our training section provides step by step instructions for ever trick in the book. Our breeding section helps you navigate the world of dog breeding.